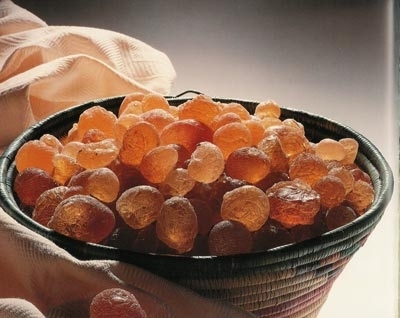 Gum arabic from the Sudan is a product of Acacia senegal and A. seyal species. Acacia senegal var. senegal is the only variety which grows in the Sudan and is the main source of commercial gum arabic (hashab). On the other hand, both varieties of Acacia seyal i.e. var. seyal and var. fistula are found in Sudan. The former is characterised by normal spines and green, white or red bark while var. fistula is characterised by inflated spines (ant-gallsand a whitish bark. Both varieties produce a commercial gum referred to as "talha" (Chikami et al 1997). Production of gum arabic is concentrated in the "gum belt" an area of central Sudan roughly between latitudes 10o and 14o North. Two areas outside these borders are in the north east (Faw-Gedared-Kassala) and in the south east along the Blue Nile/Upper Nile border. The Gum belt’s gross area is estimated to cover 520,000 square kilometers, roughly one fifth of Sudan's total area. It spans over 12 states: Western Darfur, N. Darfur, S. Darfur, N. Kordofan, W. Kordofan, S. Kordofan, White Nile, Upper Nile Jonglie, Sennar, Blie Nile and Gedaref. The belt covers parts of the clay and sandy plains. The sandy plains are in the first seven states and the clay plains are in the latter five states. The elements necessary for quantifying the production potential of gum include land use trends, areas currently under A. senegal and A. seyal, tree densities, and current production trends. Recent estimates of production potential indicate that it is possible to double Sudan’s current production (i.e. to 50,000–80,000 tonnes) from existing natural tree stocks, plantations raised through afforestation over the last decade, and plantations to be established up through the year 2000. Table (1) : Gum arabic production in Sudan. (5- year annual averages), 1960–94 (tonnes). 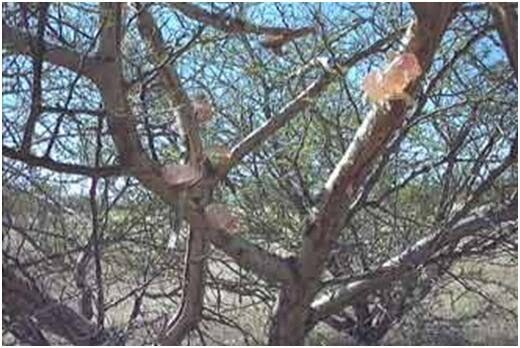 Gum hashab is collected from A. senegal by tapping, whereas all gum talha (from A. seyal) is collected as a result of natural exudation. Tapping begins when the trees are just starting to shed their leaves. Ore traditional methods of tapping involved making small incisions into the tree with an axe which, over the years was replaced with a specially designed tool. After this superficial injury, tears of gum form on the exposed surfaces and are left to dry and harden. After five weeks the first collection of gum is made, with further collections from the same trees at approximately 15–day intervals until the end of February, up to five or six collections in total. At present little cleaning or sorting is undertaken by the producer (collector) of the gum. Some degree of cleaning and sorting may be undertaken by small village traders to whom the producer sells his gum, but it is usually undertaken by the large traders after it has been sold and prior to selling it to the Gum Arabic Company (GAC). If the GAC buys the gum, it cleans and sorts at its own warehouses in the regional centres of the gum belt. On arrival at the GAC depot at Port Sudan, every consignment of gum hashab is recleaned, sorted and graded in preparation for export.